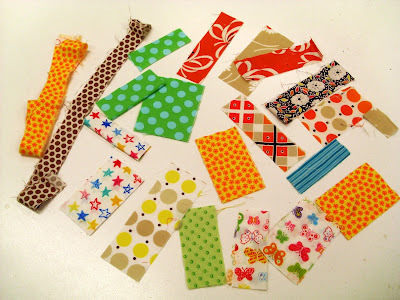 I'm always amazed by what gets left in the scrap bin at my stitching class at Amitie each week. Look what I scored last Tuesday!!!! These will most likely find their way into some stitched greeting cards, or maybe a quilt like this one ... or perhaps this one! i LOVE scraps too and don't know how people can part with them...crazy I know! One girl's scrap is another's inspiration! I constantly have this internal dialogue going on about what is unusable and should get chucked and what should go in the scraps drawer. Would love to see a string quilt!! Love Quilt 2 - what a Good Girl you are saving all your scraps - I must say they do co-ordinate beautifully! I've definitely gone pro with scrap hoarding! Nice score there miss andi! Now I would have grabbed those scraps too and the links for the other quilts, yummy! KJR in the scrap bin? Score! Great scraps - great score! Hi Andi, I love the tickertape quilt too - have plans to make it - well, it's on the long list !! What a great blog! I've been wanting to learn how to sew and this is making me want to dive in even more.